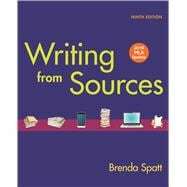 Thorough and practical, Writing from Sources is an indispensable guide to source-based composition. Using a skills-based approach, students begin with the building blocks of research writing—annotating a passage and summarizing a source—then progress through more complex steps, such as synthesizing multiple sources and writing a full-length research essay. Along the way, dozens of readings by professional writers and clear, helpful exercises provide models for practice and proficiency. Known for its clear and helpful advice, Writing from Sources teaches the fundamentals of research writing that students will use throughout their college careers. Brenda Spatt taught English at Herbert H. Lehman College of The City University of New York for thirteen years and also at Borough of Manhattan Community College before becoming an administrator at CUNY's Central Office. Her titles included director of academic affairs, executive assistant to the Chancellor, and university associate dean for executive search and evaluation. *Dinesh D’Souza, from What’s So Great About America?